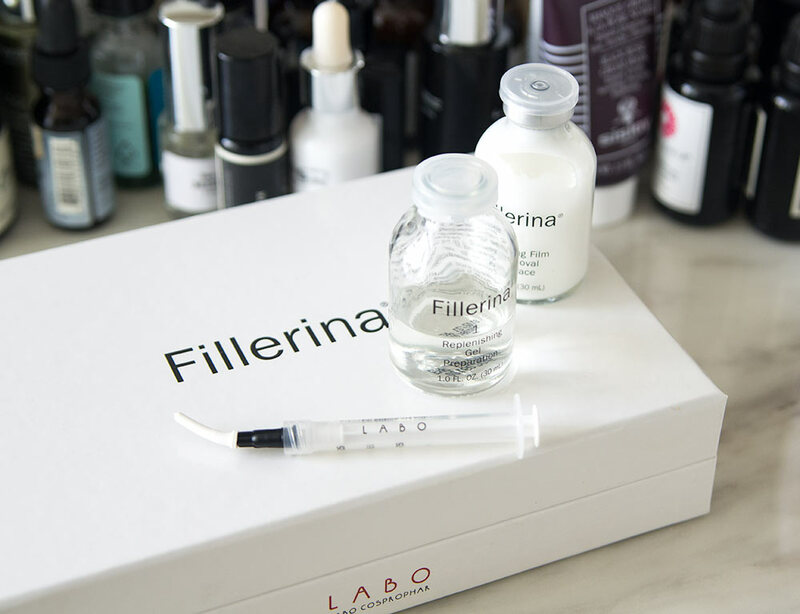 When Fillerina’s PR team here in the states reached out wanting to send me their topical face and lip filler products, I was thrilled! I’m a huge fan of hyaluronic acid. I’d slather it all over if I could afford it, but since I can’t, on my face and injected into my lips will have to do. Fillerina is an Italian company whose products have been available in the EU for around five years, but are now making their way to the United States and can be bought on Amazon or Fillerina’s website. 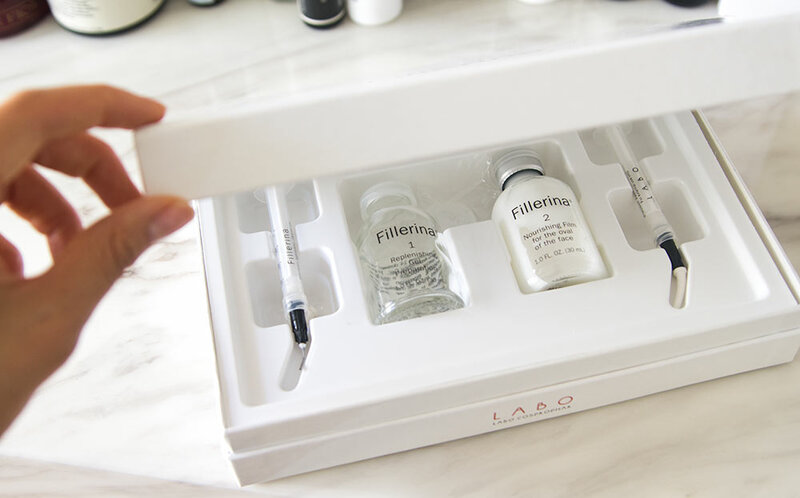 The topical face and lip filler products are made up of six different sizes of hyaluronic acids. The brand explains that the smallest sizes are able to penetrate down to the deepest layers of the skin, drawing water in and subsequently plumping and smoothing the look of fine lines, wrinkles and even – lips. I tested out Grade 1 for both the face and lip fillers and found they were capable of subtle plumping, smoothing and improving skin texture. Read on for my full review. How to use it: Apply on clean, dry lips 5x a day. At first, I wanted to conserve the product, so I only pressed the plump release 2-3x, but quickly realized when I pumped out more product I saw better results. I recommend pressing the release button 5-6x. Allow the product to completely saturate and cover the lips and around the mouth. Let sit for a few minutes before applying any lip products. The brand recommends you use this product for one month at a time with three month intervals in between uses. Pros: I really like this product a lot! I have lip filler in my lips currently – volbella – but I did notice visible plumping and smoothing of my lips. The plumping is gradual. So, you may not notice it right away, but what really shocked me is when I forgot to use it for a few days and my lips deflated! That’s when I realized what a difference it was making. It also improved the color of my lips! From sun damage and general aging, my lips have taken on a light brownish discoloration along the border. The Fillerina Lip Plump brightened my lips making them pinker and more even in tone! I assume from the increased hydration. Cons: Like I mentioned before, once you stop using this product your lips will go back to normal. I also noticed that the top layer of my lips would get a little dry and peel, but once I made sure to apply a lip balm on top it wasn’t an issue. Verdict: This is a great product for boosting the appearance of your lips! Go for Grade 2 or 3 if you want lots of volume or have deeper lines along your lips. Grade 1 is great for people who already have generally full lips (either naturally or from filler) and just want to give a little boost, smooth their lips and/or improve the color. 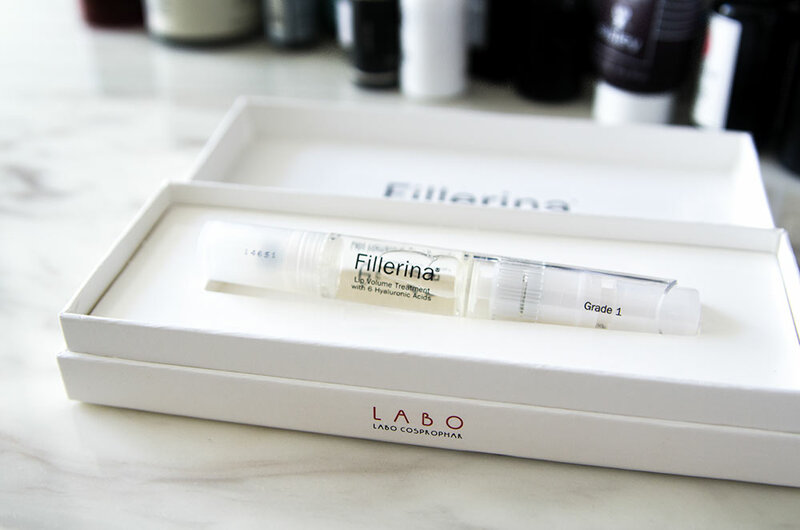 Tips: The Fillerina Lip Plump can cause a little dryness and peeling of the top layer of your lips. Make sure to apply a lip balm on top. (Cosmetic Gel): Aqua, Glycerin, Sodium Hyaluronate, Hydrolyzed Glycosaminoglycans, Caprylyl Glycol, 1,2-Hexanediol, Butylene Glycol, Sodium Hyaluronate Crosspolymer, Disodium EDTA, Hydrolyzed Hyaluronic Acid, Hyaluronic Acid, Tropolone, Hydroxypropyl Cyclodextrin, Hydrolyzed Sodium Hyaluronate, Pentylene Glycol, Ethylhexylglycerin, Palmitoyl Tripeptide-38, Acetyl Hexapeptide-37. How to use it: On clean, dry skin, using the precision applicator (one for the gel and one for the film), apply the cosmetic gel tracing back and froth across the skin on areas you would like plumped. I applied it to my nasalabial folds (laugh lines), in-between my brows, on my temples, my cheeks, on the deeper lines on my neck and even on my lips. Allow the product to sit for ten minutes. I found it to be a little runny, so lying down helps while you wait. Once done, pat the remaining product into the skin. Using the second precision applicator apply the nourishing film on top and gently pat into skin. Make sure to drink lots of water while using this product. Pros: The ingredients in the cosmetic gel are very minimal and clean with six different types of hyaluronic acid and peptides. No harsh chemicals or irritants, so I was excited to try it and knew it would not irritate my perioral dermatitis. The nourishing film on the other hand has alcohol, parfum, and citronella, which could be possible PD irritants, so I did not use the second step (which the PR rep for this brand said was fine and just advised I top with my normal moisturizer). After the third night and up until the end of the first week, I noticed significant smoothing of my skin along my temples where I have a few acne scars. The scars looked less visible. And significant plumping, smoothing and enhanced pinkness was apparent of my lips! Even my laugh lines appeared smoothed and plumped. Cons: But that’s where things stopped. Each night I applied the gel and would excitedly awake hoping to find the smooth visage of my twenties staring back at me only to see almost imperceptible improvements. It was as though the progress plateaued after the first week. While my skin took on a smooth, slightly plumper appearance, the bands on my neck did not improve. I think for deeper lines Grade 2-3 would be a better option. Grade 1 seems to be more for overall smoothing of the skin, blurring out fine lines and slight plumping. 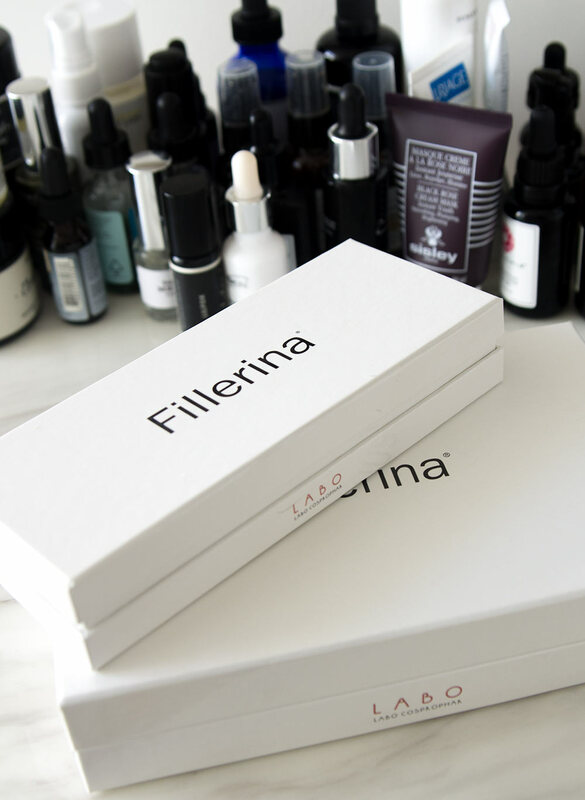 Verdict: If you want to try the Fillerina face filler, I highly recommend you go for Grade 2 or even 3, even if you don’t have deeper lines. 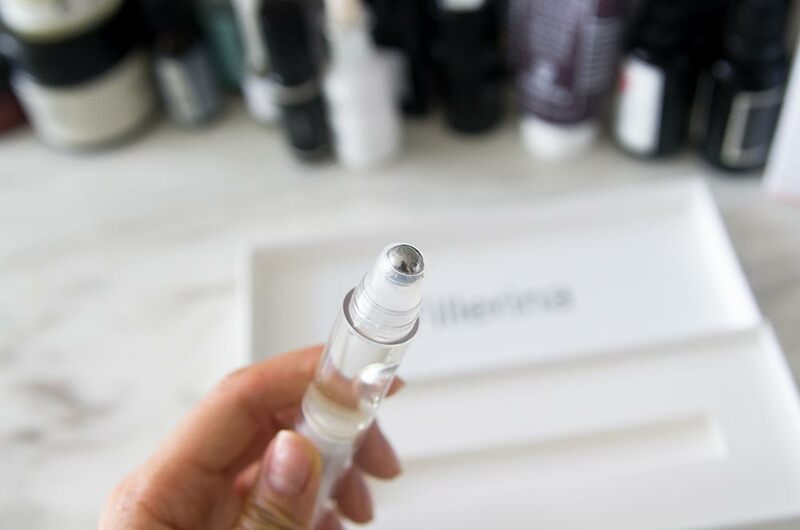 The higher grades have more small size hyaluronic acid molecules and from other reviews I’ve read online will give you more bang for your buck. Tips: Use this product at night after applying your lighter serums, but before you put your moisturizer on. Also, you will notice some pilling, which is excess product rubbing off, so it’s best to use this product at night. I used it in the morning once and had little white flakes rubbing off of my face all day. Not hot.